HayPigs!® Reach New Heights With A Brand New Product Launch! HayPigs!® are delighted to announce the addition of a brand new enrichment toy to their award-winning HayPigs!® Guinea Pig Circus™ range. The HayPigs!® Tightrope Teeter Toy™ is inspired by a circus highwire and provides guinea pigs and other small animals with a food based treat challenge. The World’s first tightrope toy for guinea pigs! The Tightrope Teeter Toy™ consists of two platforms with a string cord between the two. By placing a food treat at one end, Rik and Helen discovered that their guinea pigs were more than happy to scamper across the wire to satisfy their bellies. 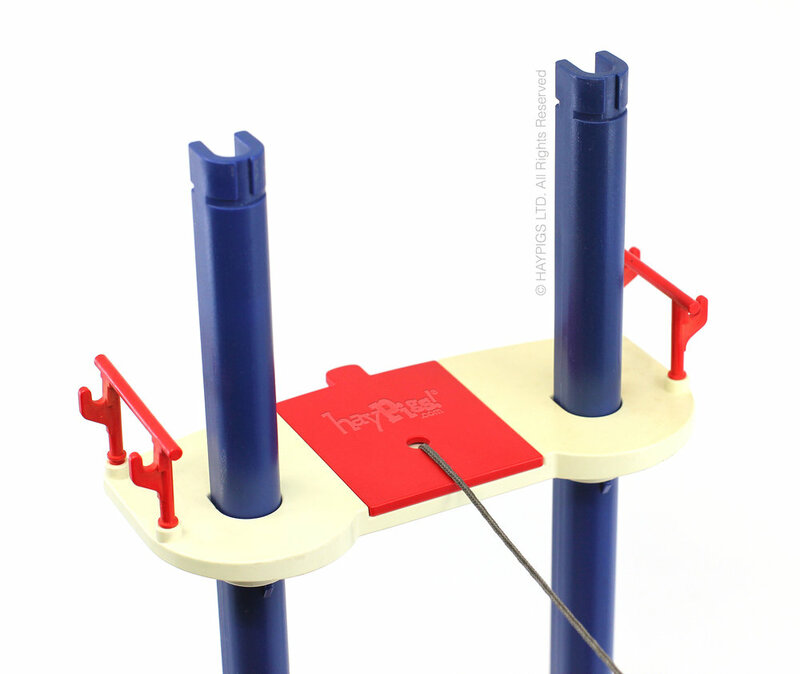 The HayPigs!® Tightrope Teeter Toy™ will retail for £19.95 and is available for pre-order now. Email enquires@haypigs.com for more details or to book a demonstration. EDIT: ⚠️DISCLAIMER: This product is not real. April fools! What is the difference between a hamster and a guinea pig? If we had a pound for every time we heard the phrase "How are your hamsters?" or "Look Isabelle, it's a hamster circus!" we'd be very rich indeed! It's frankly astounding how many people confuse the two. Yes, they are both small furries with two eyes and a nose, but you wouldn't call a dog a cat, so why do people do it?! Just before Christmas we got some fabulous coverage in the Sunday Times which resulted in the article we were featured in being talked about on BBC Breakfast News. In it, the guest analyst discussed the latest trends in pet products, with consumers looking for higher quality, luxury products for their pampered pets. He then made reference to our Cavy Cannonball™ - Tilting Tunnel (featured on the front cover of the Sunday Times Home supplement) and called it a "hamster cannon"(!). Well, we just had to laugh, here we were again, confronted by another case of mistaken identity. So why does it happen, is it that difficult to tell the difference? 3. They have four legs. OK, got to state the obvious now, but yes, they do have the same number of legs. That said, both species use their legs differently; piggies tend to stay on all fours while hamsters are more likely to sit up on their back feet and use their front paws to hold food or climb. 4. They are related (but it's a fairly distant relationship). Both guinea pigs and hamsters belong to the order of Rodentia - so they are both rodents. But they don't share the same family; guinea pigs are members of the Caviidae (or Cavi) family while hamsters are members of the Cricetidae family. 5. They have very similar teeth. Two large incisors top and bottom and then a row of premolars and molars for grinding down food. These teeth are continuously growing hence why it is important that your small furries get the right nutrition and forage to wear them down. *there are obviously different breeds of hamster and their sizes can vary, but this is based on two of the more common breeds found in pet shops; Syrian hamsters and Dwarf hamsters. 2. A guinea pigs life expectancy is considerably longer! You can expect your guinea pig to live 5-8 years if it stays fit and healthy whereas a hamster typically lives 2-3 years. 3. Guinea pigs are herbivorous while hamsters are omnivorous! Put simply, guinea pigs are vegans (kind of!!) and will not eat meat, although it's by necessity rather than choice! A hamster can eat 'meat' (or put scientifically; obtain chemical energy and nutrients from materials originating from animal origin) although it is more likely to be in the form of insects rather than a full-on roast dinner! 4. Their offspring are very different! Guinea pigs give birth to pups that are born with hair, a full set of teeth, eyes wide open and the ability to run around. A litter is typically around 2-4 pups. A hamster’s offspring will be born without sight and hair and their litters can be as large as 20 (although typically more like 6-12 pups). 5. Guinea pigs are a lot more sociable! We're not just being nasty to hamsters here, but it is a well-known fact that (in general) guinea pigs enjoy interacting with one another and indeed, other animals (including humans!). Yes, they are small furry socialites! In fact, this need for constant connections is so strong, guinea pigs can really suffer in isolation, become depressed and even die from loneliness. In contrast, hamsters aren’t fussed about hanging out with one another and can actually become very aggressive in each other’s company, particularly when there is food about! 6. Guinea pigs are not good climbers! While you may catch your guinea pig scaling over a low-sided play pen or ascending a staircase, they are not good climbers (in the truest sense of the word). What I mean by that is, they don’t pull themselves us using their paws. Instead, they tend to jump (and are actually rather good at it!). In contrast, hamsters love to climb and often scale up the bars in their cage. 7. Guinea pigs cannot run in a wheel! Let’s be very clear here; guinea pigs CANNOT run in a wheel, it’s physically impossible for them and quite dangerous. While our hamster friends will happily run all day in a wheel, a guinea pig’s spine is simply not built for it and trying to use one will cause them pain or even permanent damage to their back. 8. Guinea pigs cannot use exercise balls! And here’s another health warning; guinea pigs should absolutely NOT be using exercise balls. Again, it requires backward arching of the spine, something rats, mice and hamsters have no problem with, but guinea pigs are simply not physically built for. 9. Guinea pigs do not carry food in their cheeks! As much as they’d probably like to(! ), guinea pigs do not have the ability to carry food around with them, this is a trait of hamsters. While it may seem amusing, it’s simply a hamsters way of food hoarding. In contrast, a guinea pig tends to wolf their food down in one go and then wheek for more! 10. Guinea pigs are not nocturnal! It’s often the case that small prey animals (such as rodents) choose to spend most of their waking hours in the dark. This is a basic defence mechanism against predators, who will find them harder to spot than in daylight. This is certainly true of hamsters, who will do most of their scurrying about and eating at night. Guinea pigs on the other hand tend to just take a nap as and when they feel like it! This is a bit of an oddity, but it has been suggested that this is a direct result of their prolonged domestication. They just don’t feel threatened like they did in the wild! So rather than sleeping at night or during the day, guinea pigs are actually masters of the power nap and (with frequent short sleeps) can be awake for as long as 20hrs within a 24hr period. Clearly a guinea pig is nothing like a hamster and there are a lot of differences between the species (listed above), so the fact that people muddle them up is somewhat perplexing. It just seems a bit ignorant and lazy to me. So the next time someone drops the 'H' bomb on you and calls your guinea pig a hamster, please point them in the direction of this blog for some light reading or memorise the content for a smug retort! Guinea pigs, cavies, piggies, fluffy potatoes, furry mini-hippos, wheek machines, grass guzzlers; whatever you want to call them, there is one thing that we can’t dispute … guinea pigs LOVE company! Not just of the human-kind either, they are social animals that need the company of their own cavy-kind. So, as a guinea pig slave (or ‘pet parent’ if you prefer) there may inevitably be a time when you are left with a single guinea pig and you need to bond them with a friend/friends. Either that, or you are just addicted to your fluffy potatoes and keep acquiring more piggies to join your herd! Whatever the situation, it is of course important that a new guinea pig gets along with you existing piggy (or piggies!). Sometimes this bonding process of introducing a new partner or member of the herd can be really easy. Excellent! But other times, well, not everyone sees eye to eye (or whisker to whisker) do they?! Most often, people will have two boys together, or two or more girls together. A neutered male can live with a herd of girls or you can have a boy-girl partnership, as long as one of them is neutered to avoid the obvious breeding implications! Neutering is not a decision to be taken lightly however and should really only be done if absolutely necessary. It is really important that guinea pigs have companionship, so the pros of bonding far outweigh the potential problems of piggies not getting on with each other. Just be prepared to have another go and persevere if the first piggy-date doesn’t go to plan! A good rescue centre can help with bonding guinea pigs, so if you have one near to you, that’s a great place to start. They can help and advise you and even arrange and supervise the ‘play dates’. We’ve had the support of our local rescue with any newcomers to the HayPigs!® herd and until recently, we had a really easy time adding to our herd of happy pigs! But with our more recent introductions it has not been so easy. This is perhaps due to the big change in the dynamic of our group in recent months, with three of the herd, including our neutered male, passing away in the space of four months (due to a variety of different issues). This upset and stress does of course have an impact on the piggies who are left and could be a factor in why the recent introductions have been more difficult. Anyway, regardless of ‘why’, here are just a few tips we have picked up along the way from our (relatively modest!) experiences of bonding so far. - Space. Lots of it. In this case, bigger really is better! Neutral territory is best (e.g. in a large enclosure on the grass if the weather is good, or on a big ‘floor time’ space) so that existing piggies don’t feel threatened by a newcomer invading ‘their’ space. We’d recommend you start with a separating wall (C&C cage is great for this or a similar cage mesh) so the piggies can see one another and interact without being able to ‘get at’ each other. We tend to keep this in place for the first few meetings and then when you do remove the dividing wall, it is less of a shock meeting! - Clean and fresh bedding to keep existing smells and scents to a minimum. Also, a small drop of lavender oil on the back of the guinea pigs’ necks can be calming and also help disguise their scent around other piggies for a period of time. - Ensure there are plenty of tunnels/huts/hideys so there is not a fight over who gets to use them. Try to allow for the free flow of movement too, so a guinea pig doesn’t become cornered by an over-enthusiastic ‘newbie’! As well as plenty of accessories, we all know guinea pigs love their food, so provide lots of tasty treats to nibble on. There’s nothing quite like some fresh grass or tasty hay and forage to distract - and relax - a guinea pig. Often, things will go well and you will see signs of friendly behaviour, or maybe some dominance from certain piggies, who want to be in charge. Most of the time this is fine and they will settle into who will be the boss and who isn’t quite so bothered! However, sometimes there will be a clash of personalities and two piggies will show dominant behaviour … neither will want to give in! Things to look out for: rumble-strutting (waggling their bottom and making a rumbling noise); the ‘who can lift their chin the highest’ game; chattering their teeth; showing their teeth; chasing, nipping or biting. None of these are ideal! Some dominance behaviours will only be mild and if the other guinea pig doesn’t rise to it, things will settle. But if neither want to back down, a full-on fight could ensue. Watch your piggies during introduction sessions and be prepared to break them up if they do start fighting - but ensure your safety too, as guinea pig teeth are very SHARP! Have a towel handy to throw over the top of the guinea pig before you pick them up or remove them from the environment, to hopefully avoid getting bitten in the heat of the moment. You might even want to put some thick gardening gloves on, or use oven gloves. If things go well in a neutral space, do then ensure to keep an eye on the pair or group that are bonding as they are returned to their usual enclosure, as this may then provoke a territory battle. Try all you can to minimise this (fresh and clean bedding, enough beds/hideys/food to avoid arguments etc.) and of course, the more space your piggies have, the better it will be! The occasional display of mild dominance behaviour or a look that says ‘get off my carrot’ is normal (let’s face it - we all have THOSE days!). If moods do change as you return your piggies to their usual enclosure, keep an eye on them and again, worst case scenario, be prepared to step in and separate them if things turn nasty. Sometimes bonding can be a gradual thing and you may need to just take it slowly with introductions and then give the piggies some ‘time out’ in-between. Other times, piggies just will not get on with each other and if this is the case, you must of course prioritise their safety and separate them to avoid fighting and injury. But when you get the dynamics right and have a happy herd of piggies all munching away happily together, it really does warm the heart! We certainly see them showing emotion in other ways however (they aren’t just fluffy potatoes, they absolutely show emotion among their companions). If you’ve ever been in the sad situation of a bereavement, you’ll know that guinea pigs appear to have a period of morning when one of their companions passes. This is clear evidence of how highly evolved they are social and emotional. If your piggie has a constantly watery eye, it could be that something has got stuck in there and the fluid is being produced to try and wash it out. This can sort itself out, but sometimes a stubborn small piece of hay, for example, might not budge. If there is something stuck in there that is visible, it could need you (if you have a VERY steady hand) or a vet to remove the offending object with some tweezers. A cloudy look to a usually bright and clear eye could also be a result of damage from a hay-poke, injury as a result of fighting or also a sign of infection. Cloudy eyes are not normal and so advice should be sought. A vet may well prescribe drops or ointment as appropriate. If one or both eyes have a sticky, crusty substance around them, this could be a sign of a URI (upper respiratory infection) or other infection that will need treating by a vet. Other symptoms of a URI could be a snotty nose, lethargy, not eating … all of which are not good news at all for these small critters, so best get them checked out by a professional. If you ever see a milky-white substance being secreted from the corner of your piggies’ eyes, then this is perfectly normal and is actually a super clever way that guinea pigs groom themselves! This substance cleans their eyes and they also rub it onto their paws to then clean their faces. 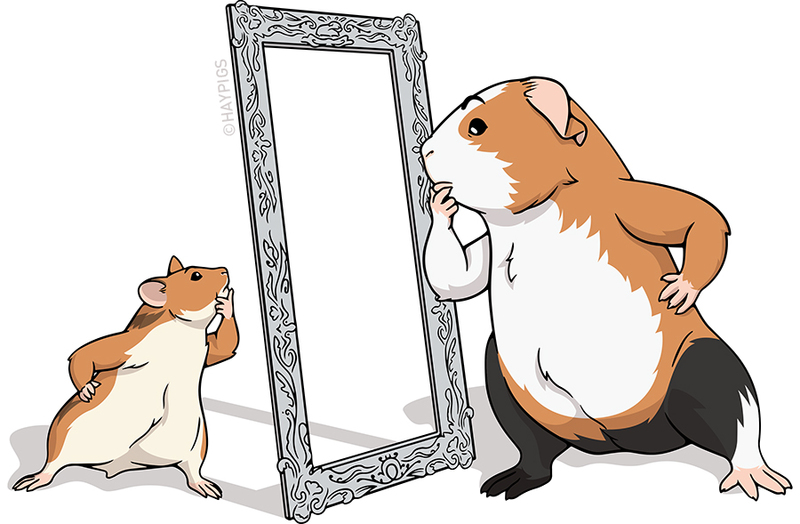 Guinea pigs are very clean animals and like to keep themselves looking beautiful/handsome at all times. So, if you hang around long enough, you might catch sight of this substance in their eyes and get to observe the cuteness overload that is their grooming ritual! So, in summary, beauty is not just in the eye of the beholder, beauty is actually right inside your guinea pigs’ eyes, waiting for them to have a good wash! Stay clear, shine bright, stay happy! It’s no coincidence that we are called HayPigs! As fibrevores, high quality feeding hay is an essential food for guinea pigs and they literally need access to it 24/7. Good quality grass hay should account for 80 – 90% of the daily food intake for your piggies, along with fresh water, vegetables and a small amount of nuggets. This might seem like a lot, but hay (along with forage) is super important, it literally keeps their bodies ticking over. Without it, a guinea pig's unique digestive system won't work properly, so please make sure they maintain a high fibre diet with loads of hay! In addition to keeping their digestive system in order, hay is also great for wearing your piggies teeth down. A guinea pig’s teeth are always growing, so regular chewing helps stop them overgrowing. The trick with hay is to make sure you are getting good quality feeding hay that is super fresh! It should be green in colour, smell sweet and be free of dust. We joke as piggy parents that it should smell tasty enough to eat ourselves! At HayPigs! we also use hay as bedding for our piggies, and while they do chomp on it (especially when their den has been freshly cleaned out) this bedding hay soon gets trampled and soiled on and we find they quickly lose interest in it as a snack food! So, it's strongly recommended to present feeding hay in something that keeps it off the floor. The HayPigs! Wheek Wagon (but of course!) is a great way to contain your feeding hay, giving good access for a herd of piggies to munch away happily on their essential fibre. But also, don’t forget you can be creative with how you present their hay too... try using left over toilet roll tubes, egg boxes or other natural cardboard items to stuff the hay into, maybe with some other tasty treats and forage hidden in there too. This presents them with more of a food challenge and some stimulation to keep their brains active. Here at HayPigs! HQ, we give our piggies fresh handfuls of feeding hay multiple times a day – it’s most interesting to them when it’s fresh out of the bag! Our piggies really love the Burgess Long Stem Feeding Hay (which is great for piggies! ), and also their Chamomile Herbage and the Dandelion and Marigold Feeding Hay. But there are lots of great feeding hays out there – look for a tasty Timothy or meadow hay. If your piggies don’t eat much of what you present for them, try something else! Some piggies can be picky, so don’t risk them not eating enough hay, experiment with different types to find what they like best*. So, it really is hay, hay and more hay! And what better way of treating your piggies than giving them a super healthy and tasty snack, that will have them popcorning with joy?! Right, I’m off to pick the hay out of my hair…and off my jumper…and out of my boots…. Did you know we now stock tasty feeding hay on our website?! Why not check it out here. Buy top quality feeding hay right here! We aren’t questioning the effectiveness of those guinea pig noses here, because we all know they can sniff out a sprig of parsley at fifty paces! But a common question, especially from those who are first thinking about getting guinea pigs as pets, is “do guinea pigs smell”? Now we think it’s fair to say that guinea pigs are generally very clean animals (we’re not biased, honest!) and as long as they are cleaned out regularly, then no, they don’t smell! Guinea pigs groom themselves and there’s nothing cuter than watching them have a ‘wash’ with their paws! They actually secrete a white substance from the corner of their eyes and use this to clean their face, as well becoming masters of contortion using their mouth to groom the rest of their body. If anything is going to cause any smell to develop, it will most likely be the urine and not the animal itself. So, keep bedding fresh, spot clean dirty areas regularly and do a full clean out at least once a week. People also wonder about the need to give your ‘pampered’ piggies a wash or a bath. There are occasionally times when a guinea pig has got a little grubby and may need freshening up, but it’s not something that needs to be done regularly, if at all with some pigs. But a couple of things to bear in mind: Long haired piggies are likely to need more grooming care than short haired ones, as their fur will have more contact with the floor of their enclosure. Boars (and occasionally sows) can also need a little more attention if their grease gland (found just above where their tail would be, if they had one) is overactive. This can be a challenge to keep clean but we find breaking down the grease with Swarfega first, before rinsing and then a quick shampoo to follow, is a good way to deal with their behinds! If you do find your guinea pig needs a bath, then make sure to use an appropriate shampoo for small animals, avoid getting water on their head and in their ears, always rinse well and make sure they are nicely dry before they go back into their enclosure, so they do not catch a chill. So, if you keep their cages clean and just assist them with the occasional extra wash if needs be, then you shouldn’t be catching a whiff of any unpleasant odours. You can just enjoy the smell of fresh hay and vegetables, although you can bet the piggies will be loving that kind of smell even more than you! tags HayPigs, Guinea Pigs, Guinea Pig Circus, Rescue Guinea Pigs, Piggies, Cavies, Cavy, Pets, Wheek, Cute, Guinea Pig Toys, Guinea Pig Feeders, Guinea Pig Accessories, Guinea Pig Gifts, Small Animals, Small Furries, Do guinea pigs smell?, Clean, Wash, Bath, Smell, Urine, Grooming, Grease Gland, How often should I bath my guinea pig? HayPigs!® are finalists in the Essex Business Awards 2018 for New Company of the Year! HayPigs!® are thrilled to announce that we have been selected as one of 5 finalists in the Essex Business Awards 2018 for New Company of the Year! It is wonderful to be recognised in our home region and we are once again honoured to be representing the pet trade at another awards event. HayPigs!® is home of the multi-award-winning HayPigs!® Guinea Pig Circus™. Our family run business designs toys, feeders and accessories for guinea pigs and other small animals . Our range of bespoke products has a circus theme and is designed to enhance and enrich the everyday lives of small furries and their owners. Products include the 'Cavy Cannonball™' tilting tunnel, The 'Circus Hidey Hut™' fleece hidey and the PATS 2017 Best New Small Animal Product winning 'Piggy Weightlifter™' vegetable kebab maker. Fingers (and paws) are now crossed that we can go all the way and scoop the top prize! Wheek! Wheek! Wheek! Ahead of their second appearance at PATS Telford this weekend, small furry accessories brand, HayPigs!® have some extremely exciting news to share. With help from their 'pawtners' Guinea Pigs Australia, they have just signed a deal to stock over 150 Petbarn stores in Australia. HayPigs!® MD and self-proclaimed Ringmaster, Rik, is overjoyed with the news, "This is obviously really exciting news and we are delighted that our range has been so warmly welcomed over in Australia. We can't thank Niomie, Steve and the team at Guinea Pigs Australia enough for their hard work and dedication in helping make this happen. It's humbling to think that we will be enriching the lives of so many small furries across the length and breadth of Australia." Steven Ferrante of Guinea Pigs Australia had this to add, "Guinea Pigs Australia is so excited to be officially launching HayPigs!® into Petbarn, Australia. With Petbarn's fantastic reach across Australia it will give more guinea pig owners the opportunity to access high quality, fun and creative enclosure accessories. HayPigs!® product range will be available on Petbarn online and at over 150 Petbarn stores by December 2018." In a triple celebration, HayPigs!® are also thrilled to have made it to the final of the PetQuip Awards for Marketing Project of the Year and also the Essex Business Awards for Best New Business. HayPigs!® Co-founder Helen is really looking forward to the awards events, "It's just lovely to have been recognised for all our hard work. As HayPigs!® is a family business, there have been a lot of sacrifices over the last couple of years, so this is a great opportunity to give ourselves a pat on the back and let our hair down a bit!" How many toes do guinea pigs have? OK, we admit it, it’s not a topic that is going to change the world, but, on the other hand (or foot), have you ever noticed how cute a guinea pig’s feet are?! And don’t we just all need a little bit of cute in our lives to keep our spirits up from time to time? So, we bring you guinea pigs’ toes. They have fourteen toes in total, with four on each of their front feet, and three on each of their back feet. All their toes have nails that grow continuously (just like ours!) and need regular trimming. (See our previous post on nail trimming for more on this.) Piggies have a soft pad underneath their foot and it’s always worth checking their feet as part of your regular health checks. That way you can keep an eye out for any potential problems like bumblefoot (the common - and much easier to say - name for ‘pododermatitis’), which is a painful infection on the bottom of the foot. Also look out for spurs on the underside of the feet, usually the front ones. Some piggies will never get any, others may have them growing quite regularly. These flaps of hard skin don’t generally cause many problems except perhaps if they are large and then tear and get infected as a result. Spurs that are large can be cut off (VERY carefully) with nail clippers to be on the safe side and avoid any potential knock on issues. Sometimes, guinea pigs can have more than the expected number of toes, and if they do, it’s most likely to be an extra one on their back feet. These can be removed, if necessary, by a vet, so seek advice from a professional if you are concerned. But, extra toes, bumbles and spurs aside, guinea pigs’ toes and feet are just totally CUTE! And if you catch sight of your precious piggies chilling out, then you will more often than not see them kicking out their back feet for all to see just how happy and relaxed they are! 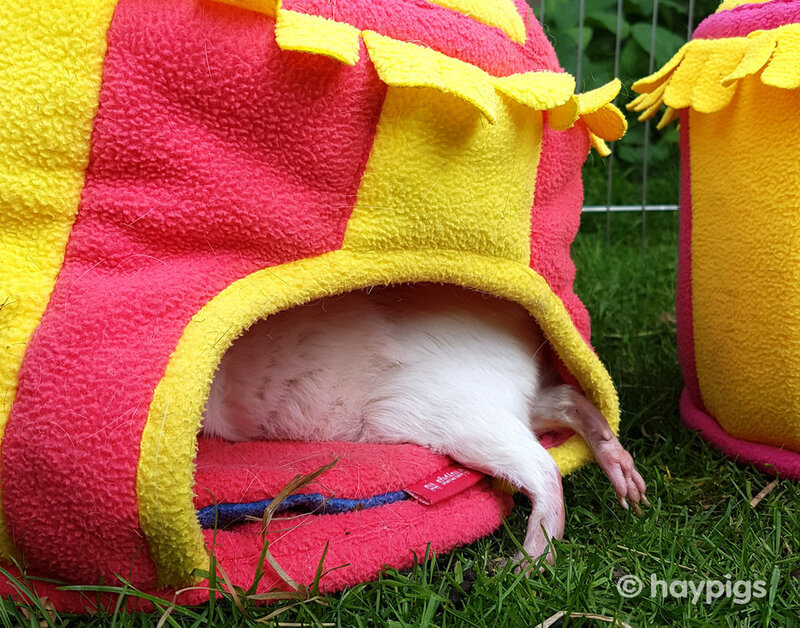 A snug and secure circus hut themed home for your guinea pigs to sleep or hide out in! Comes with two interchangeable, removable pee pads. The hut can be machine washed and squashes flat for storage without creasing. And it sounds just like you’d expect…. but at a smaller decibel level than made by the human pig-slave’s sneeze! An occasional sneeze from your piggy is not usually anything to worry about. Just like us, guinea pigs can get particles up their nose and they may sneeze to shift the blockage. Hay is often the culprit and even when getting good quality ‘dust extracted’ hay, there can sometimes be enough dust to cause a little irritation. On two or three occasions now we've had one of our piggies develop a sudden crackly noise through their nose when breathing. Immediately our guard has gone up, with concerns of the dreaded URI (see below) yet they've had no other symptoms and a day or two later a big sneeze has shifted it and the noise has gone. However, there are times when sneezing should be treated more seriously and may require swift action. If there are additional symptoms as well as sneezing, like runny eyes and nose, crackly and noisy or laboured breathing, lethargy and hunched posture, coughing or wheezing and/or a change in behaviour, then it could be a URI (upper respiratory infection). A URI can usually be easily treated with antibiotics, as long as it is caught EARLY (this is so important!). If left, it can be fatal, so don't mess around if you have suspicions and seek the advice of your vet without delay. Guinea pig sneezes may also be the result of an allergy to a particular thing, like a strong scent of perfume for example. Symptoms of an allergy can sometimes be similar to a URI, but if you are concerned, always see a vet to first check if it is the serious issue of a URI, before looking at any potential allergies. 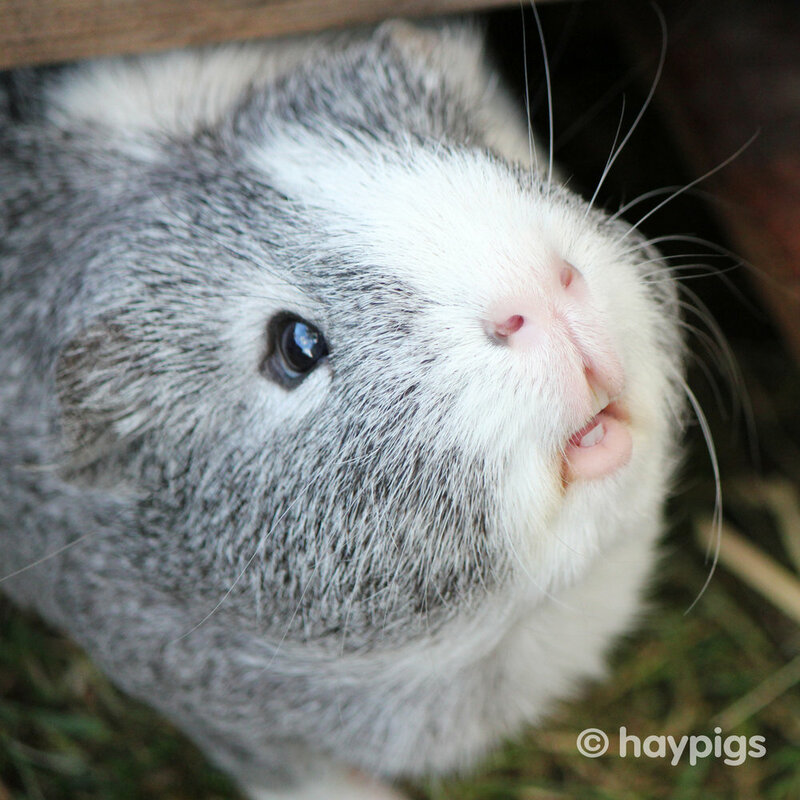 Guinea pigs do sneeze and the odd one now and then is usually more ‘cute’ than ‘concerning’! But, as always with your lovable furry friends, if there are other signs and symptoms along with the sneezing, then don’t waste time in taking the appropriate action to ensure the good health of your precious piggy. As with many of the questions about our gorgeous guinea pig friends, the answer is not always as obvious as it might seem! So, no, guinea pigs do not originate from Guinea, in west Africa. And, while we’re at it, they aren’t related to pigs either (but that’s another story!). If not Guinea, then where?! Well, the wild relations to our domesticated guinea pigs originate from the Andean region of South America (Colombia, Ecuador, Peru and Bolivia). Wild guinea pigs are often found living in the rocky areas and grassy plains that this part of the world provides. Although they do not burrow themselves (like a rabbit would), they have no problem using and sheltering in any unused tunnels made by other animals, or naturally occurring crevices and hidey holes. 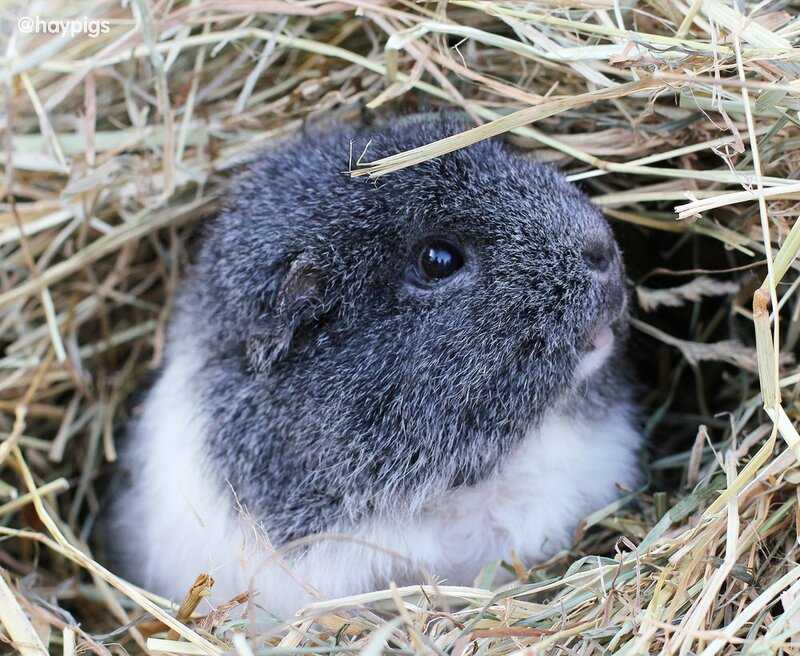 Those natural instincts to hide from prey are still to be found in the guinea pigs we know and love as pets today, so that’s why it’s important to provide them with tunnels and hideaways to avoid any undue stress. It would seem that guinea pigs were first domesticated in order to be eaten, and indeed they are still on the menu in some South American countries today……not something that, as owners of our pet piggies, we can even begin to contemplate! But the guinea pigs we care for and love as pets around the world today are a bit like ‘second cousins three times removed’ from their wild origins. For a start, wild guinea pigs certainly don’t have the range and variety of colours and hairstyles that our pet guineas do! 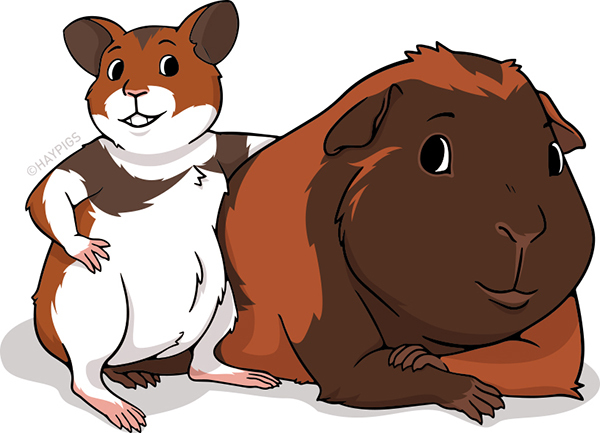 So, in summary, not-from-Guinea guinea pigs (that aren’t pigs) originally come from South America, but thanks to lots of interesting things happening throughout history (see the ‘All About Piggies’ section on our website for more on this! ), we are fortunate to have ended up with our furry guinea pig companions to share our homes. So, how many years of joy can you expect to get from your furry piggie friends? It’s the million-dollar question that lots of people ask, and of course, the answer can vary depending on who you speak to...but let’s see if we can dispel a few myths and give you an idea of the sort of commitment you need to be prepared for, if you are going to give these gorgeous little critters a forever home! A guinea pig is not a hamster. So, this (you would think) should be fairly self-explanatory, however in our experience, we have come across many people confusing guinea pigs with hamsters! Now, not only do guinea pigs have very different needs and grow much larger than their (very distant!) relation the hamster, but the life expectancy of these creatures also differs. On average, a hamster can be expected to live for 2-3 years, depending on breed type and lifestyle. So, go on then, what is the average lifespan of a pet guinea pig? Well, without hedging our bets too widely, the average lifespan for a domestic guinea pig is 5-7 years, although as with any living creature, there are many factors that can influence this. They have been known to live for much longer than 7 years, indeed as the 2006 Guinness World Record states, the longest living guinea pig survived for 14 years, 10.5 months! While this record may not be the norm, guinea pigs are certainly a pet that you need to be confident about affording the care and devotion to, for a good number of years. How can we help our precious piggies to enjoy a long and happy life? There are lots of things you can do to give your guinea pigs the best chance of reaching old age. Good diet, a large enclosure, plenty of exercise, social interaction, good hygiene and proper response to any potential health issues are all factors that can contribute to a long and happy life. So, ensure you are feeding the correct foods in the right amounts, with plentiful hay and forage on the side! Provide your piggies with ample space and opportunities to run around, using tunnels and stimulating toys in their cages/runs or during floor time/out in the garden. Guinea pigs are social animals, so make sure they have a bonded cage mate, so they don’t get lonely or bored. Of course don’t forget, most guinea pigs love spending time with humans too, so enjoy some lap-time snuggles with them. Clean their enclosures regularly and thoroughly and ensure you handle your animals daily to keep a close eye on their health, seeking advice from an exotic vet should the need arise. As with any animal, there can be health problems in guinea pigs that occur at any age. This can be very hard to deal with, especially if a young piggie is taken ill. With the best will in the world, and despite all the best efforts to provide a healthy environment for our furry friends, there will be problems beyond your control. We suggest that you find a good exotic vet who is used to dealing with guinea pigs and act quickly should you need to, as they can go downhill quickly. So, unlike their ‘wild’ guinea pig relations, who can only be expected to live for 1-4 years, pet guinea pigs can live 5-7 years providing you with many years of love, snuggles and wheeks! So, be prepared to do all you can to provide them with a long, healthy and happy life, and they will indeed brighten up your days in return! Why do guinea pigs lick? Have you ever noticed how your guinea pig likes to lick your fingers, hand or face? Have you ever caught your guinea pig licking itself or indeed another piggy? Well while this may seem a little strange, it's perfectly normal. In fact, in many cases it is a sign of affection! Guinea pigs love to groom themselves and licking is an effective way of giving themselves a little wash. No doubt you may have witnessed your piggy in an impressive yoga pose while attempting to hit the right spot! This is just like a human having a quick wipe with a flannel! Being social little fur balls, guinea pigs also love to groom one another and again, this is perfectly normal. If this is happening frequently in your herd, this suggests they are very content with one another and enjoy each other's company. If your guinea pig starts licking you, this could be a very good sign that he or she likes you. It's generally regarded as a very affectionate gesture. In the same way that they show affection through grooming one another, they could well be attempting to groom you to! Guinea pigs may also lick you to lap up the salty taste on your skin. In this case, it's less affection, more exploiting your presence for a tasty snack! Likewise, they may detect the resonance of some food you may have been handling. Have you ever noticed how piggies may still be interested in your hand, even when all the herbs have been pillaged?! All in all, guinea pig kisses, or licks, are a wonderful experience. Not all pets are so giving, so enjoy sharing this little intimate moment with your fur babies. HayPigs!® wins Best UK Small Pet Accessories Provider 2018 in LUX Awards! We are delighted to announce that HayPigs!® has won Best UK Small Pet Accessories Provider 2018 in the LUX Magazine Pet Product & Service Awards 2018! Yay! LUX Magazine recognises those who have helped this industry see exponential growth in recent years. They have rewarded those individuals, organisations and enterprises who strive to produce the services and products which benefit the well-being and health of mankind’s best friends. 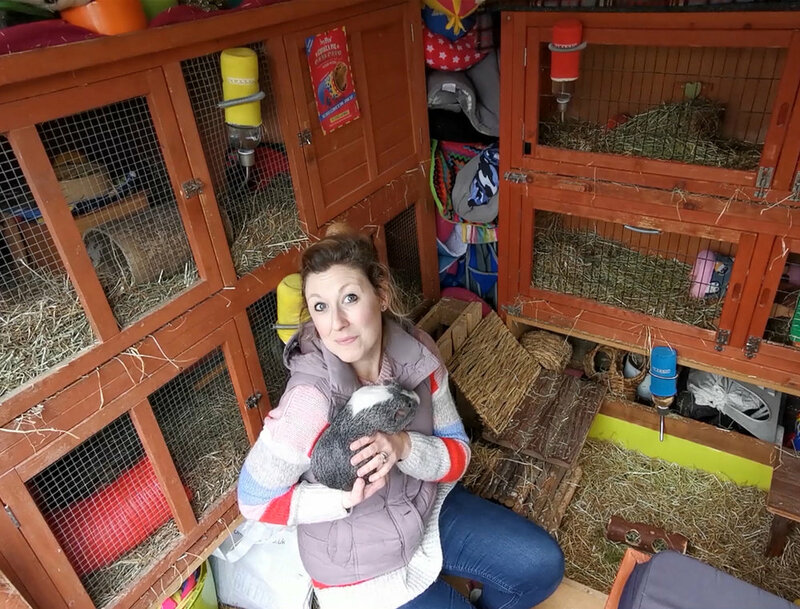 "A couple of years ago, had we told you that we were going to launch a 'guinea pig circus' and design products specifically aimed at guinea pigs, you would have thought we were mad (and some still do!)." explains Rik, "It was quite a hard sell to be frank, many in the trade didn't believe there was enough of a market to focus solely on small animals, let alone specialise in guinea pig accessories! But we had a clear vision of what we wanted to do and most importantly, really knew our target market well. This gave us great confidence in our product and brand idea." "Early days were tough, for our idea to work we needed to commit to a significant amount of stock in order to launch with a coherent, themed range of products. All our products were bespoke, some of the them required expensive tooling, there was significant testing and IP costs and once our stock landed, we also had to deal with storing it all. But thankfully, when the whole package was presented to the trade and most importantly, our potential customers, they loved it! The feedback we have had over the last year has been incredible and made all the hard work worthwhile." Eager to establish their brand quickly, HayPigs!® spent a good portion of last year on the road attending trade shows and public events. Along with their relentless social media activity, these public events have done a lot to build and grow a loyal and committed fan base that HayPigs!® are very proud of. Helen explains, "We knew before we started this adventure that the guinea pig and small animal community are a very special bunch. They adore their pets and go to great lengths to please them. As guinea pig owners, we refer to ourselves as 'pig slaves' and if we're honest, our pets probably eat better than we do! Attending public shows like the National Pet Show has been a great opportunity for us to meet with our social media followers, introduce ourselves to new pet fanatics and get our educational messages out there. It has been a real family affair, those of you who attended PATS Telford last year may have found me with a new born baby strapped to my chest. We joke that Scarlett (or 'HayBaby!') had done 3 shows before she was even born!" In a year that has seen them scoop the best new small animal product in the PATS Telford showcase, get to the final of the PetQuip Awards for Pet Product of the Year as well as being finalist in the Innovation category at the PIF Awards, HayPigs!® have a lot to be proud of. This in addition to their range being taken on by several of the UK's largest retailers and many of the wonderful and diverse independents up and down the country, it's been a great start for the Essex based family business and their band of small furry friends. "We can't wait to show you what's coming next" says Rik with a big smile on his face, "The show's only just begun!" 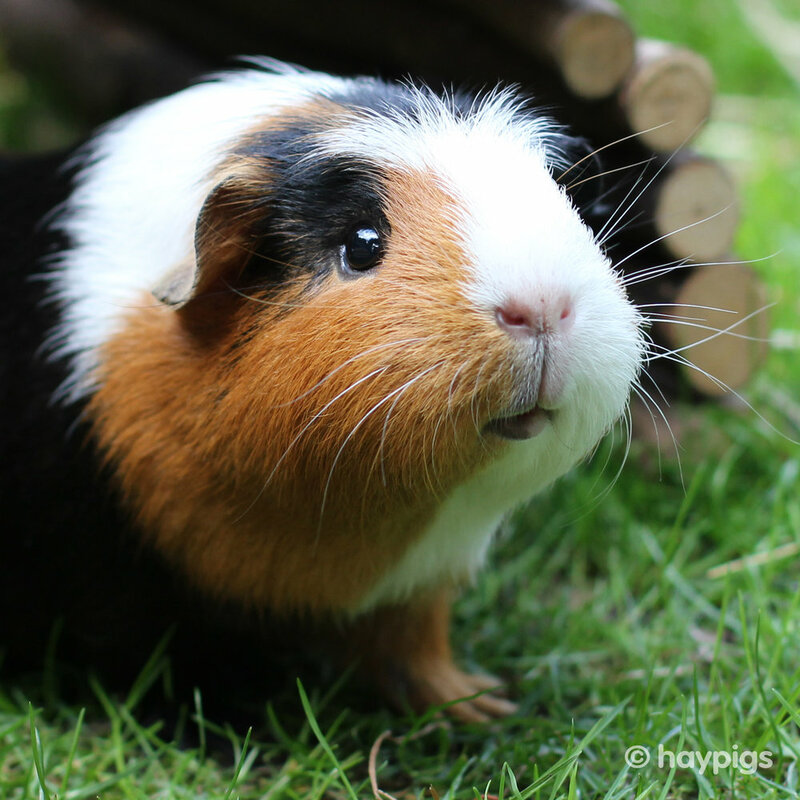 Grass Time for Guinea Pigs - Some Top Tips! 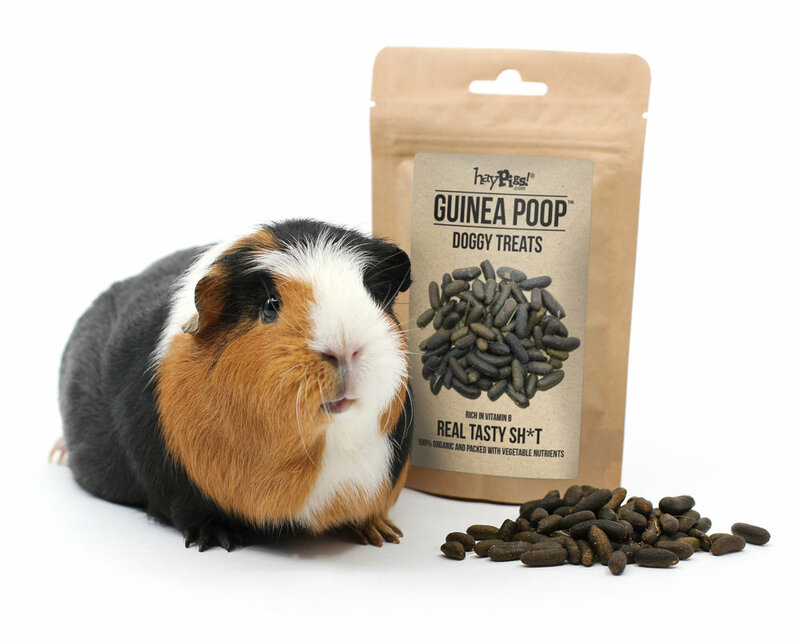 HayPigs!®, home of the award-winning HayPigs!® Guinea Pig Circus™ and designers of toys, feeders and accessories for guinea pigs and other small animals, are delighted to announce the launch of their brand new healthy dog treat, Guinea Poop™. "With innovation at the core of our business, we believe we have spotted a real commercial opportunity that has been completely overlooked by the rest of the trade. We believe our new vitimin B rich doggy treats will be a massive hit!" "Having spent a lot of time with our guinea pigs and indeed our border collie, Sansa, we noticed she had a real interest in the piggies backsides. On closer inspection, it wasn't the pigs themselves that she was after, but the poops they produced." HayPigs!® new dog treat recycles and reuses fresh guinea pig poops and packages them in a resealable, foil lined pouch. 100% organic and packed with vegetable nutrients, each poop is carefully inspected for size and weight before being added to the pack. While the initial production run began in the UK, demand has meant that HayPigs!® have now approached LA Guinea Pig Rescue for help. They were recently involved in the dramatic rescue of a hoard of over 700 guinea pigs, a record for the US. It is hoped that a joint Anglo American venture will allow harvesting of an abundance of poops from their Californian base. If you have enjoyed reading our press release and can spare some change to help out the incredible team of volunteers at LA Guinea Pig Rescue we would be very grateful. With all the medical attention, feeding and neutering required, their average weekly bill is currently running at around $1300. We have set up a Just Giving page (below). Any donation, no matter how small, would be greatly received. Have a great Easter wheek-end everybody! EXCITING TIMES AHEAD FOR AWARD-WINNING HAYPIGS! Fresh from scooping the best new product award for the small animals category in the PATS Telford showcase, newcomers HayPigs!® are already looking forward to exciting times ahead, "We're really chuffed to have won this award in our first year of trading." says Rik Cridland, MD and self-proclaimed Ringmaster, "PATS Telford was a wonderful experience and we are really appreciative of the warm welcome we received from the pet trade community. It feels like we are part of one big family already! Thank you to everyone who has supported us to date, it really means a lot. It's been an exhausting experience, but so worth it! We look forward to the exciting journey ahead and can't wait to show you what else we've got planned for HayPigs!®"
HayPigs!® mix of product innovation, quirkiness and good humour, caught the judges' eye after they entered four of their six circus themed launch products into the showcase. Their winning product, the HayPigs!® Piggy Weightlifter™, is said to be the World's first, horizontal, pet friendly, vegetable kebab maker. It provides guinea pigs and other small animals with an enriching food challenge while also entertaining their owners. "The judges were unanimous in their choice of this winning product." said the panel "They felt a fun circus range for small animals was a great addition to the market. The winning product from the range was a novel idea and will provide hours of enjoyment."